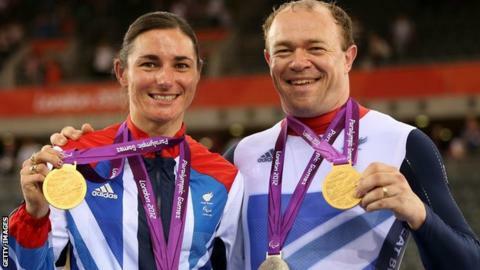 Fourteen-time Paralympic gold medallist Dame Sarah Storey has launched a new British elite women's cycling team with husband Barney. Storey, 39, is Great Britain's most successful female Paralympian, with 25 medals for cycling and swimming, while Barney, 39, won three golds as a pilot. "I am delighted to be able to bring an elite women's racing team back into the UK peloton," said Storey. "We want to encourage everyone to give their best from a platform in the UK." Their aim is to take the team - Storey Racing - into the UCI peloton. The Storeys, who are based in Cheshire, have run teams before - their Podium Ambition team folded in 2016 due to financial pressures - but they hope that this venture can attract more sponsors and fund their long-term ambition. Neah Evans, Bethany Crumpton, Monica Dew, EJay Harris, Katie Prankerd and Hannah Dines were all part of the Storey's previous set-up which folded in October 2016. These six riders will be joined by five new faces as Dannielle Khan, Jennifer George, Laura Cameron, Chanel Mason and junior Mercy Webb join the squad. "I hope this new platform will give us a strong basis on which to build over the coming years as there remains a unique opportunity to create a world-dominating, entirely British-focused professional team should the right backing be found," added Storey. "As we see better and better coverage for women's racing, and therefore a greater return on investment for sponsors, we hope to play a part in creating that opportunity."